I’m back!! Life is bananapants because my house is in upheaval due to getting new floors (and new paint and ceiling scraping and such), but it was time for a podcast!! I’m sharing my post-summer report on how my shopping/eating plan with my teenagers went and their adventures in doing their own laundry. Also, I got all confused back in May/June about episode numbers, and that confusion confused me again! I refer to this podcast (within the podcast itself) as 176, but it’s actually 177. Sorry! SongFinch! Check out this amazingly creative songwriting service. I’m totally in love with the song they wrote and recorded for my husband. They captured his interests, made it fun and the quality is great. Go to SongFinch.com and use Promo Code: CLEAN for $20 off your personalized Song From Scratch. And as promised, here’s a photo of him (with his mom) after a performance as Elvis! And yes, I made the costume. Read Older Post Have a Wonderful Summer! I’ve been missing you and have been waiting for the new episodes to drop for the fall! I’m so excited to listen (tomorrow) to what feels like a good friend in my ear, encouraging me on my path. All summer I’ve been thinking about the container concept and making lots of little decluttering decisions easiest first. Great to be back in the swing of things! LIstened to your podcasts from the beginning over and over again. They are great to listen to while doing housework or while working on anything you need motivation to get started on. Glad you enjoyed your Summer! I am so glad you are back. I discovered you this summer and haven’t looked back. You (unknowingly) have held my hand while getting dishes done, cleaning counters, unpacking seven large overloaded suitcases, cleaning out the toys, crafts, etc. I AM A HUGE SLOB! I try hard not to be. 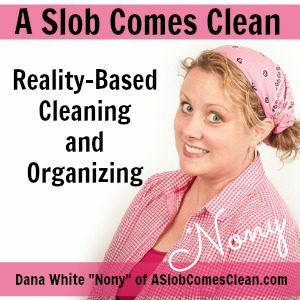 With 4 kids and no tidying skills(I am 3rd generation slob) I work hard not to be. Thank you Dana for putting yourself out there. I am rambling because I can’t tell you enough what an impact you are making in my life. God Bless and Love to you. Yay! So glad you’re back. Can’t wait to listen. Thanks for “getting back to work” on behalf of the rest of us! I’m eager to hear your every word on renovating a house, as I need some intelligent and funny help with that. I find myself easily over-whelmed and under- confident in making renovating decisions, due to years of slob/house-related failures. Don’t spare the stories. Hi Dana, I’m excited to listen, too. I have read so many books on decluttering & organizing. I was so happy to find yours. I’m listening to it for the second time. I love your decluttering questions. I always thought I was doing it wrong when I walked things to the other side of the house & put them away, but when I tried to stay in one room & put things in a “put away basket,” they would stay in that basket for months, cluttering up the room! Can’t wait to read your other book! Blessings! I love your stuff and have used it and recommended it extensively! Your brain works like mine, which is very helpful. Question: Do you think your Teaching Kids to Clean ebook would be useful for teaching adults with developmental disabilities to clean (or teaching their staff how to teach them)? And does the book have very specific checklists for different rooms? I remember seeing a bathroom cleaning checklist you made for your kids once, and thought it would be very helpful. Hope you don’t mind me pitching in an answer. I don’t know about severe disabilities (probably) but I found Dana’s advise on teaching children really helpful for my wife and myself. We are both autistic/ADHD and struggle with executive dysfunction, which means super simple things can need a bit of extra explaining. It might be harder with physical disabilities but it certainly helps for adults with mental disabilities. Thanks for the input! It sounds like it will work. This podcast says it is unavailable on the Apple Podcast app, and episode 177 will play but there is no audio. The more recent ones are playing fine. Over the summer, I went back to the start of the podcast series while waiting for your return (after I listened to both your books). I was eager to hear these, and glad I can listen through your site. I love to listen to you while working on my house. I now have hope for my home. Thank you!